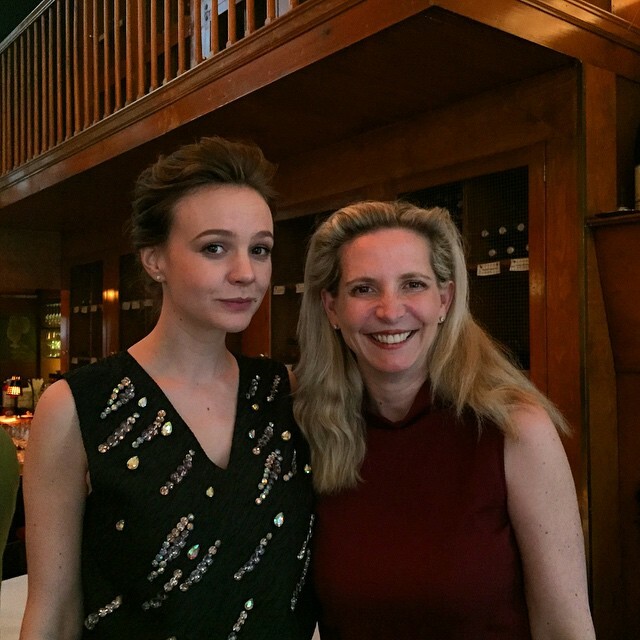 On April 21, our co-founder Amanda Foreman interviewed Carey Mulligan and Matthias Schoenaerts about their roles in Thomas Vinterberg’s new adaptation of Thomas Hardy’s Far From the Madding Crowd at New York’s La Grenouille. Below is a transcript of their talk. Amanda Foreman: I think the reason why we love the nineteenth-century novelists — the Brontës, the Dickenses, the Hardys, the George Eliots of this world — is because they both give us these traditional truths about humanity, and yet they also dissect them, they eviscerate them. The premise of Far From the Madding Crowd is very simple. It’s about love, it’s about betrayal, and it’s about money. These are eternal concepts. They revolve around a young woman named Bathsheba Everdene, who is a young country girl who suddenly comes into a great deal of money. With that independence comes not the freedom she thought she was going to have, because she is surrounded by three male antagonist-protagonists. And it’s her visceral struggle for independence vis-à-vis these three men. Because it’s about Bathsheba, I’m going to start with Carey Mulligan, who plays Bathsheba. I must say, you’re currently also playing a role in David Hare’s Skylight, about a woman who refuses to be defined by the men around her. Is this a theme in your life? Carey Mulligan: No, I think I’ve just been lucky with these parts. You’re always looking for strong female characters to play, and this came along in the same year as Skylight and also a film about the suffragettes which I did [Suffragette will be released in October by Focus Features.] So it’s been exciting to work on real women. AF: Almost forty years ago, Far From the Madding Crowd was adapted by John Schlesinger, and Julie Christie played the role. The way it was directed then, it’s about a woman whose heart is bursting with emotion. The way you play it, it’s about a woman whose head is bursting with thoughts. It seems to me you are relishing the opportunity to get rid of that old trope that men think and women feel. CM: Yeah, I mean there’s lots of passages in the book about how every emotion that she has expresses on her face, and she blushes very easily… But there’s also huge passages where the narrator dives into her head, and incredibly complicated thought processes. There’s a whole passage around a very dark moment when she’s opening a coffin. She goes through about eight different stages in the way she feels about this one act. That level of complexity is such a gift as an actor, because you have the source material to go to. AF: Yet this amazingly clever woman is brought down by some incredibly stupid decisions. CM: Yes, she’s spontaneous, I suppose, in some of her decisions. I think they’re very small decisions that snowball, and that’s part of the problem. But that’s what I like about her as well. She’s a flawed character. She’s a real person. She grows from eighteen to her late twenties, and you see her falling into all the pitfalls that you fall into as a girl growing up. She starts out quite honestly. In the first couple of chapters in the book, this gentlemen proposes — with a lamb, which is lovely. But she doesn’t know him, so she says no. And that’s such a great, honest start to the story. AF: Matthias, you’re currently in three historical dramas, and they’re all extraordinary parts because they are men who bring out the best in the women around them. And that’s a gift for an actor to be able to do that, and yet still be the man that all the other men are jealous of. What’s it like to be playing that sort of role, that both the men and the women somehow want to be or have you? Matthias Schoenaerts: I kind of look at it in that very specific way. I tend not to approach things in a too psychological… I think we’re too dominated by the brain, and we should connect with the heart more. I think that’s what this film is about. AF: You play a man, Gabriel Oak, who’s a farmer when the film begins, and who tragically loses everything in a freak accident. He ends up working for the woman he once proposed to. What keeps him going is this core goodness. Is it difficult to play someone who’s completely and utterly good? MS: I suppose yeah, because you might run into a character who ends up being utterly booooring. It’s true! You always look for some ambiguous quality, or some contradictions, or some contrast. But in this case, his qualities are so uncommon. All united in one being. That makes it a challenge in itself. CM: Oohh, he’s not creepy! AF: Just amazingly selfish and self-obsessed! …and Sergeant Troy, who is a rotter. Moving swiftly on, then, Hardy says she loved Troy in a way that only a self-reliant woman loves when they abandon their self-reliance. To me that seems amazingly modern, that idea of what happens when a strong woman falls in love: there’s going to be earthquakes and chaos. And yet you keep her inner strength going. Was that part of the fascination that you had for the character, this tension? CM: Yeah, and one of my favorite moments in the book, which we put in the film and it got cut, and it’s a great tragedy! But it’s a great line. It’s just after Troy’s left her, and it’s all fallen apart, and she’s left now with no husband, and she has to recover. There’s a very melodramatic moment where she runs out and she sleeps by an oak tree, and wakes up in the morning when her maid finds her; she’s slept out all night. The maid comes and tells her that her husband’s gone. She sort of absorbs it for a moment, and she’s devastated, obviously. But then she… I can’t remember the whole line, but it’s so great. She says, “Stand up and be cut to pieces; that’s what I intend to do.” It’s such a great marker of her character that despite everything she can… She’s given herself to this person, lost herself completely, and been caught up in this insane whirlwind romance, which was obviously a mistake. But she can then get up and brush herself off and get going. AF: I don’t want to put you on the spot, but of course I’m now going to put you on the spot — but in a nice way! Bathsheba says to Farmer Gabriel Oak, “I don’t want to marry you because I want somebody to tame me.” You make it come across as some extraordinary feminist line. Was that how you viewed it? CM: Did it come across? That’s great. That’s how I meant it to be! Yeah, to a degree, these are the things that she thinks, and she says exactly what she thinks. That’s one of her greatest qualities and biggest downfalls, that whatever she thinks, it comes out of her mouth. And I think that in that moment that’s what she thinks. I think part of the reason that whole proposal goes so terribly wrong is that he doesn’t pursue her strongly. That she’s sort of lost in her thoughts and doesn’t know what to make of the proposal, and he just lets it go. And her whole eight-year journey starts. AF: So Matthias, you’re the one who makes the proposal, you’re the thwarted lover. Reading about you, I’ve noticed you often talk about the craft of your acting using adjectives and words that are akin to painting. Then I discovered that actually, for you, painting’s much more than a hobby; it’s another expression of your creativity. And you said, “I want to work like Jackson Pollock made a painting.” To me, that means you’re talking about constraint versus total freedom. The constraint that Pollock used, and the ideas that were underlying his artistic philosophy, and yet the total freedom of his work. That’s what Gabriel Oak is. He’s a man who’s both constrained and utterly free. Is that… Am I reading too much into that, or is there something in there? MS: It’s absolutely true. I’d rather be Jackson Pollock than Mondrian [Piet Mondrian, a Dutch painter from the early twentieth century], who’s just like totally depressed when a black spot hits the red square. Because it comes down to the concept of energy flowing, and having a very strong intention about something. But then when Jackson Pollock made his drip paintings, he knew when he was going from left to right that he would never know how much paint would land on the canvas. And so there’s a very clear intention and a very strong feeling for what he’s doing. At the same time he’s being surprised by an accident. And that accident will inspire him to go somewhere else. I think it applies to acting as well. It’s the same as jazz. You get affected by what the other one does, and what that does to you. That is, to me, the key of true creativity. It’s not calculating everything upfront. With film, everything is planned, everything is rigged. So how can you bring something that is true and has its flaws, in the moment? That’s the danger of becoming a control freak, because we approach everything in such a psychological way. We’re also dominated, especially in film and in film culture, by psychological realism. Everything is Stanislavsky, you know? But there’s so much more than Stanislavsky. And Stanislavsky is fantastic, but you have Brecht, you have Artaud… Those are all different approaches. And that’s why, for example, I love David Lynch. Because he has a different perception. He trains his brain in a different way, and therefore he has a different take on life. And therefore his work is unique. AF: Do you think Gabriel Oak knows what happiness is? MS: I think he knows what happiness is, but deep down in his soul. I don’t think it’s an intellectual concept for him. Happiness is not a concept, it’s a thing. It’s something that he wakes up with. AF: I don’t think Thomas Hardy believed in happiness. There’s a line in the book that says, “All romance ends in marriage.” In the film, which is amazingly, beautifully shot, it’s gorgeous, there are these long scenes with the two of you, in the water, sheep-dipping. What I really want to know is, was that amazingly exhilarating, an earthy experience? Or was it just really smelly and exhausting? AF: I bet! They should put some water heaters in the water. There’s another line that you say that David Nicholls, who’s done a wonderful adaptation, but this is straight from the book… He says, “It is difficult for a woman to define her feelings in a language which is chiefly made by men to express theirs.” It’s one of the most powerful, powerful lines. Yet all through the film, you show that Bathsheba doesn’t need language. She has other ways of expressing herself: through music, through singing, through work, her relationship to nature. Is there any other way in which she’s able to express herself? CM: I suppose she just lives by her own… Her actions are just basically what shows her character. I think it goes back to the line about “Stand up and be cut to pieces.” It’s more about the decisions that she makes. And she makes some bad ones. But when she does choose to go back… When the storm happens on the farm — and she’s married to Troy, so she’s in a very different place… But she chooses, on her wedding night, to go out and try and save her farm. Again, you see her true character coming through. I think it’s a lot about what she does rather than what she says. But I had so many great lines. And that’s how we got into trouble — well, I got into trouble — because I kept on fighting for, like… “Stand up and be cut to pieces”: that was a fight when I found out that was gone! There are so many great, great lines. And these amazing sequences. It’s such a dense book, there’s so much and it’s so hard. I think Thomas did an incredible job, even though I battled him the whole way through and made his life very difficult! AF: And you sing! You’ve got your art, Matthias, and you’ve got your music, Carey! Is this a whole other area you’re going to develop? CM: No! Not at all, no. I sung in a couple of films in a row, and it’s become a sort of weird thing. But I don’t… I just sang at school, you know. But I think it’s great — I got to sing with Michael Sheen, and that was my mum’s idea of heaven. She’s Welsh, so singing with a Welshman is a very big deal in our house. AF: There’s a really high body count in this film, which is ostensibly about a rural community, but they’re falling like flies! You’re practically the last man standing at the end. Gabriel Oak is a changed man. But what I wanted to ask you is, what’s changed him? Is it love? Or is it tragedy? MS: That’s a tricky one. MS: Wow, wow, that’s so difficult. The only thing that will change you for the better is love. AF: I think you’re right. I think it is love, too. Just saying. MS: When you talk about love, keep it simple. AF: Thank you very much, both of you, for two amazing performances in a film that just sings with quality and depth and passion. For those of you who haven’t seen it yet, you are in for such a treat. Thank you very much, all of you.